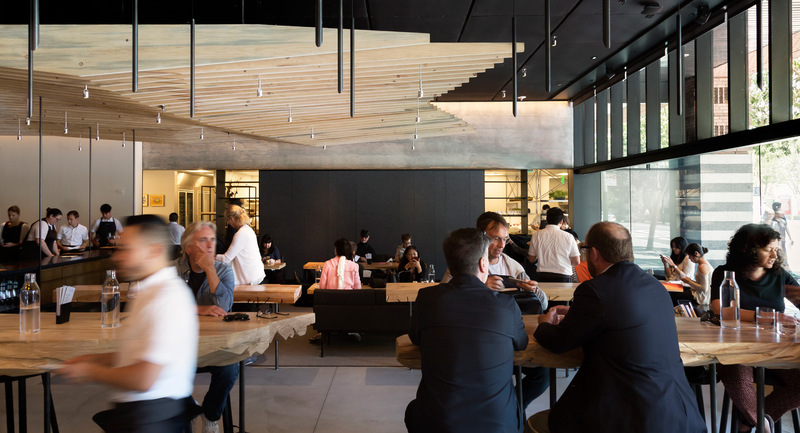 Inhabiting a street-front space in the Mario Botta–designed portion of the newly reopened SFMOMA, In Situ stands at the intersection of art, design, food, and community. In support of chef Corey Lee’s vision, the design celebrates visibility, accessibility, comfort, and openness by foregrounding the guest’s physical experience. 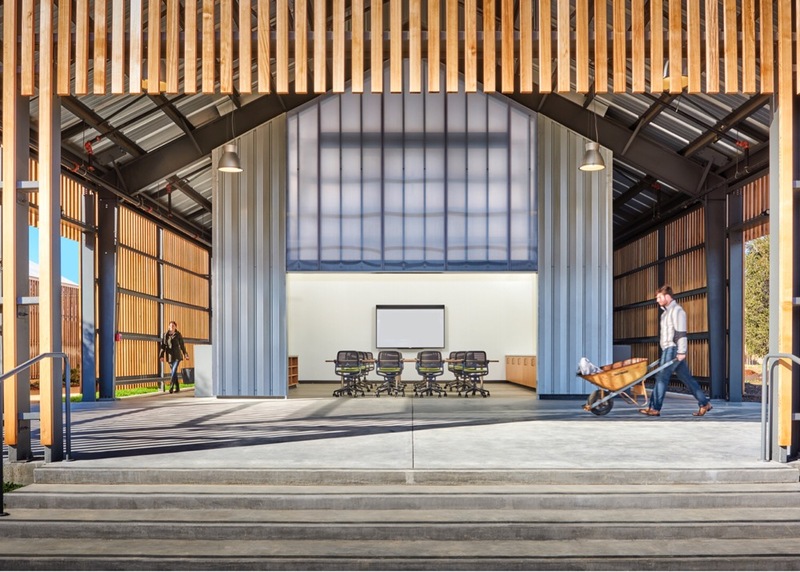 Emphasizing tactility and acoustics, the space juxtaposes the rough with the refined, leaving the interior shell of the building relatively raw and exposed while contrasting it with custom lighting, furniture, commissioned art, and a sculptural wood ceiling. Located in Manhattan’s Fulton Street subway station, Voyager Espresso eschews the typical artisanal aesthetic of contemporary coffee culture for a more futuristic design and material palette, reflecting the client’s scientific approach to coffee. In transforming a neglected block-long passageway within the New York City subway system into a vibrant public space for shopping, eating, and gathering, TurnStyle serves as an inspired model for future transit retail in the city. Wexler's refined spin on farm-to-table barbecue in San Francisco's financial district offers guests an authentically char-grilled dining experience, minus the smoldering cinders. 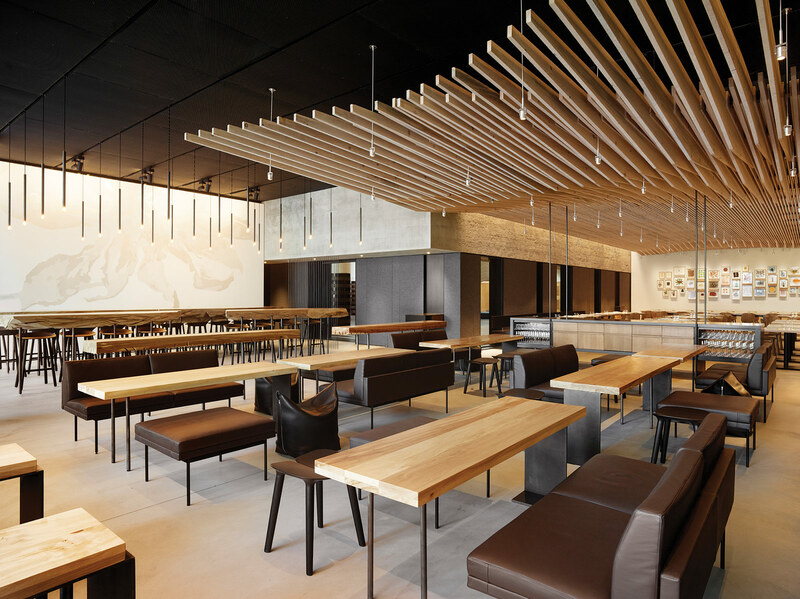 Inspired by its progressive grill menu, local multidisciplinary firm Aidlin Darling Design dreamed up a 46-foot-long billowing ceiling canopy that hovers over the dining room like a plume of smoke. The feature also extends to the exterior, doubling as an awning over the main entrance that beckons passersby. "The original design, based on an undulating plane of smoke, was designed in both AutoCad and Rhino, [using the] lofting feature that extrapolates geometry between two curves," said Adrienne Swiatocha, project architect for Aidlin Darling Design. The canopy’s softly curving profiles at the exterior and at the end of the wall were hand-drawn. 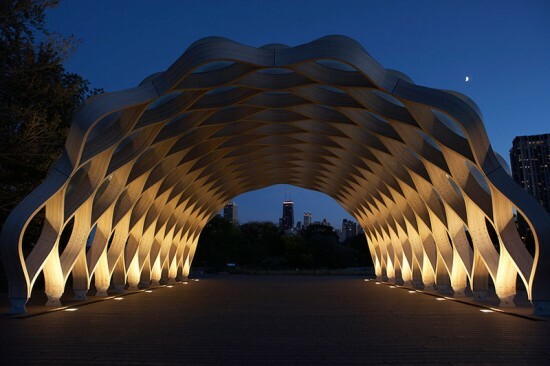 The architects used Rhino to amplify and adjust these curves throughout the center portion of the canopy. This varying amplitude echoes the way smoke dissipates across a room. "[Then], we sliced the three dimensional plane every few inches to generate a bunch of curved line profiles, and offset it by 5 inches to create a second, curving, thickened line." Once a 3/4-inch profile had been achieved for each of the 180 ribs, an inverted J-shaped hook was carved into the profile of each slat so every piece could be hung from a metal rail system. "For each slat, you can take a point from the J-hook and let Rhino extrapolate a profile that connects those hooks so they slide," Swiatocha explained. The architects also added notches in each hook to prevent them from slipping. "It was really challenging because the ceiling was low and had exposed ductwork, sprinklers, and lighting. All those conduits run beneath the joists so we had to design our system around those preexisting elements." In addition to providing easy access to the ceiling, the system of ribs also made for a speedy installation on-site and a clean look that didn't use invisible fasteners. To produce the ribs, which are made from medium density fiberboard (MDF) and medium density overlay (MDO), the Aidlin Darling team contracted the services of Alan Vien at Laser Alliance, who tested both laser and CNC cutting methods before suggesting laser fabrication for speed and cost savings. "Material can sometimes become charred with lasers but, because we were painting each rib, that wasn't a problem," Swiatocha said. The teams chose MDO for the exterior ribs due to the material’s durability and weather resistance. Both MDO and MDF ribs were painted the same charcoal hue. Each rib hangs from a metal rail system that was fabricated and installed by Chris French Metal of Oakland. Laser-cut, carbon steel rails were screwed to a plate stock metal hanger, and then bolted to the ceiling joists. "Both the right and left rails in this case had arcs of different radius lines that weren't symmetrical," said Chris French of the challenge presented by the wooden canopy's irregular volume. The studio generated an install image in VectorWorks with a datum line. "While installing the hanging bars, we would measure from the center line of the bracket to that datum line, plus or minus, according to that drawing." Once the metal rail system was installed, the ribs, which were sequentially numbered, were hung from front to back by one person on a ladder in a matter of hours. "It was fun to see it go in so quickly," said Swiatocha. 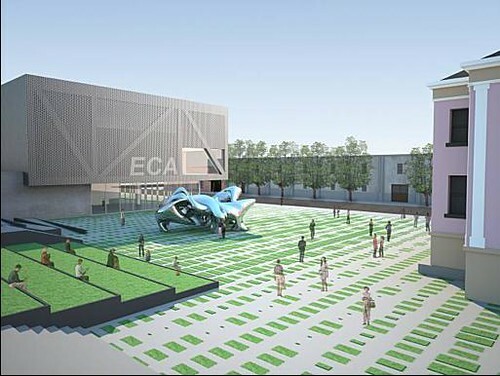 The SF Chronicle's John King today shares the shortlist for the new Emeryville Center For the Arts. The six contestants are some of the city's best young firms. In fact organizer David Meckel—stressing this push for emerging talent— initially said that the winner should not be a fellow of the AIA. The finalists include: Aidlin Darling, Edmonds + Lee, Jensen Architects, Ogrydziak Prillinger Architects, Schwartz and Architecture, and Envelope A+D. Their plans are currently on display at Emeryville City Hall, next to which the arts center will eventually sit . 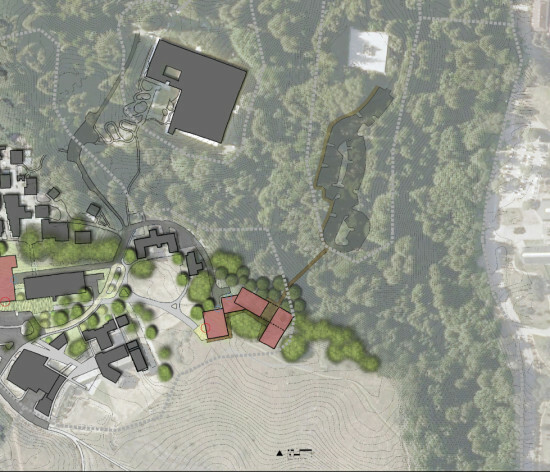 All except Edmonds+Lee include the site's existing 1940's brick building. Aidlin Darling includes a sloped green roof for film watching; Ogrydziak Prillinger layers spaces in and out of the structure; and Jensen architects opens it up with large, movable glass walls. The winner will be announced next week, so stay tuned. The upcoming $480 million SFMOMA expansion is a big deal, and the names that have been bruited about are certainly Big Names. But you can also hear the rumblings: Why no local firms? And especially why so few women in the mix? There's reason to hope that the names mentioned so far are still tentative, and that there's a chance that the official shortlist, due in May, can remedy these shortcomings. Ideally, there would have been an open competition to bring in a broad spectrum of talent. (Renzo Piano, after all, won an international competition to design the Centre Georges Pompidou when he was in his thirties.) But since that's not going to happen, what about inviting some of our local firms to take a shot at it? As the San Francisco editor of AN, here's a few I think could do us proud in tryouts: --Aidlin Darling. This rising firm's elevation of an old warehouse building (355 11th St. in San Francisco) into a modern sculpture bodes well for what they could do with an actual museum space. --Anne Fougeron. The most prominent female architect in the city, Fougeron does classic modernism, but with a twist that feels uniquely Californian, like the JFR house in Big Sur. She likes to use slatting, which would be a refreshing counterpoint to all that brick. --IwamotoScott. 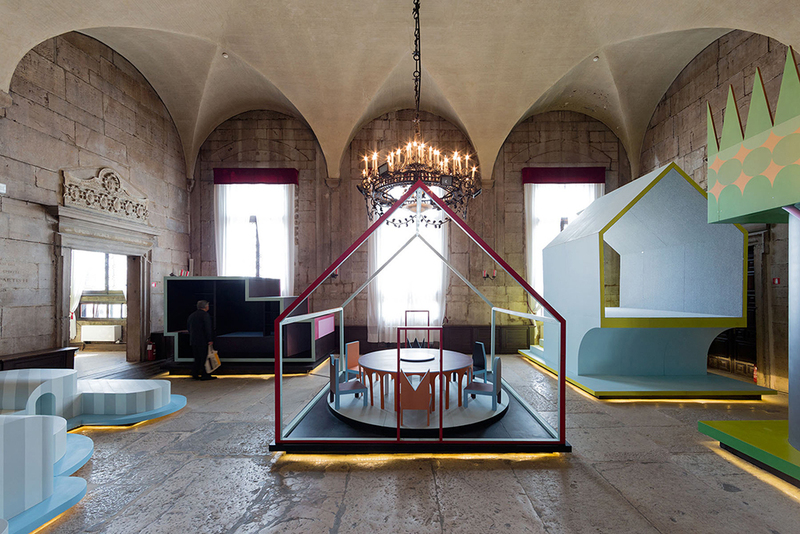 They're known for their conceptual, not built works. 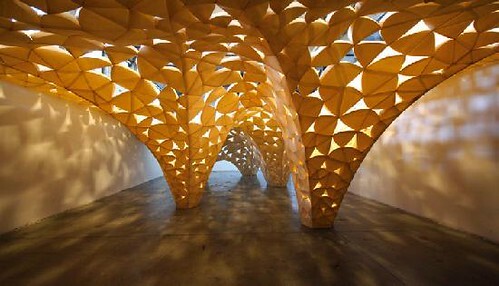 But installations like "Voussoir Cloud" give rise to fantasies about wandering through galleries like clouds. --Ogrydziak/Prillinger. They have some very strange, interesting buildings, like the Gallery House they designed for an art-collector couple. Imagine the Botta being attacked by salt-crystal deposits. --Brad Cloepfil of Allied Works. Ok, he's based in Portland, but his renewal of 2 Columbus Circle for the Museum of Arts & Design in NYC is delicate and amazing: ribbons of windows run down the wall and along the floor as translucent strips of glass. If you were Neal Benezra, who would you grant an audience to?